Could we highlight transport interchanges? Would they help people get around the city and strengthen neighbourhoods? Connections are an essential element of a good mobility system within a city, and more than ever, people in Dublin are hopping from one mode of transport to another. They’re walking for a while then hopping onto a Dublin Bike for the rest of their journey. Or they’re getting of an inter-city train into Dublin, catching a Luas, and then finishing their journey on a Dublin Bike. Or they’re driving to a park-and-ride and then catching a train. Or they walk or cycle to a nearby car-sharing (ie car club) vehicle. Or they’re catching a bus, and then transferring to another. Or they’re generally cycling their own bike, but instead hopping onto a Dublin Bike on Fridays when they’re heading to the pub after work with colleagues. “Those figures are surprisingly high and demonstrate that there’s a currently high latent demand for transfers which currently may not be well served.” David O’Connor, Lecturer in Transport and Urban Design, DIT School of Spatial Planning. 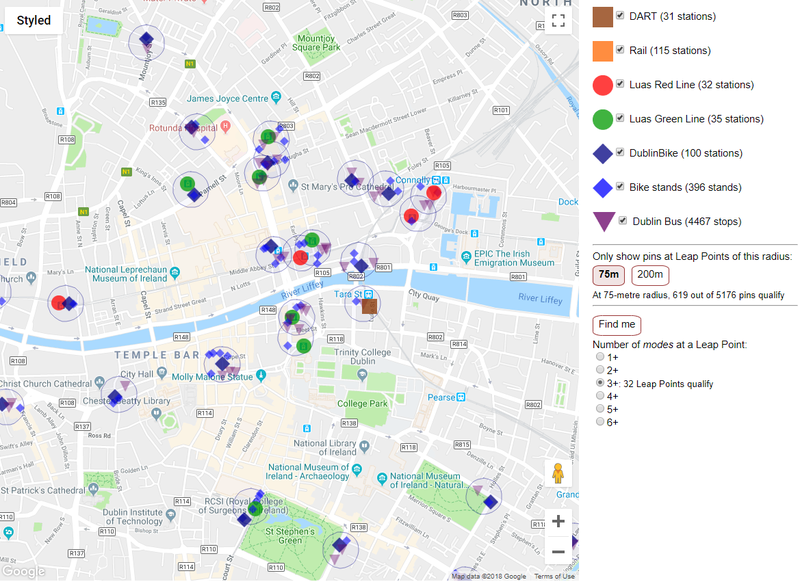 Could we highlight the existing transport connections in Dublin by creating ‘local mobility nodes’? Would such a concept would help us with future transport infrastructure decisions? Can we help people with locating these connection points, or make connections more enjoyable? Could we also help people to choose healthier options (for both them and our planet)? Would it be useful to have a simple and 'sticky' method for highlighting mobility points? We could call these mobility points 'Leap Points' - both reinforcing the national transport card (Leap Card) but also because the verb ("leap") captures perfectly what these points are about. They could be retrospectively applied to existing locations at which various transport options or interchanges are grouped - for example if we were to map existing infrastructure points (eg Luas stops, Dublin Bike stations etc), we might see where natural, existing, clusters are. They could also help us with the creation of new interchanges - for example when new interchanges are being planned as part of the BusConnects review. We think they might help reinforce the sense of neighbourhoods, and possibly help serve as a community focal point. We are currently designing this trial. Can you think of locations where the idea might apply? Let us know in the comments below (or on social media)! What should be located at a Leap Point? Eg neighbourhood map, bicycle pumps, community notice board, bookcrossing? We've now created a mapping tool to help us to better see and explore this idea - here's Version 3 - and we'll making further tweaks to it over the next while (eg including further transport options). Busaras/Connolly is an interesting location because you have Luas, Intercity and city bus, Intercity rail, DART, DublinBikes, and Taxis all in close proximity; off the top of my head I don’t believe there’s a similar confluence of transport modes anywhere else in the city. In terms of what to put where, maps seem obvious unless you’re unfamiliar with or uncomfortable with them (or even unable to use them, because you’re blind! ); not everyone has the appropriate spatial skills to translate from a 2d representation to the 3d world around them. What other ways could location information be conveyed? Signposts? NFC or similar short-range electronic broadcasts targeting nearby smartphones? Interactive maps, rather than flat? Useful information to present other than maps: capacity of nearby bike rack. average wait time at nearest taxi rank. Next bus due (number, destination) at nearest bus stop. Some sort of interactive “where are you going? let me recommend a mode of transport to you” thing. I think if the roads were planned smarter (e.g. Trinity Luas disaster point which blocks up all traffic). And the Dublin bus actually provided a reliable service. People wouldn’t be forced to take their cars. The Luas is a fine example of a well run company. On time, reliable and professional with proper security. Dublin is not even that big compared to London. But depending on where you live getting from work to home on public transport a cumulative time of driving on the motorway from Dublin to Galway. Eastern European countries have no budget or resources and are so much more advanced in this area.Everyone hates their commute and it’s the worst part of the day. Why is it so difficult to have organised transportation in this country?